Personally, the ocean means everything to me, but I’ve never met a person who didn’t love getting to the sea side or coast. While scuba diving and swimming I started to encounter more and more plastic rubbish in the seas around Ireland. It’s sad and terrifying in equal amounts that sea creatures and birds will eat that plastic which will then seriously interfere with their health. Everyone can do something, feel empowered. Use less plastic, buy a reusable water bottle and fill it at home, in Ireland we buy and throw away TWO MILLION plastic bottles every day. If we lined those bottles up, they would stretch from Dublin to the Cliffs of Moher, back to Dublin and back to the Cliffs again, that’s just one day’s usage! Buy a reusable coffee cup, bring a paper bag to your supermarket for fruit & vegetables, ask your supermarket staff (respectfully) to try and use less plastics. Put as much plastic as you can into your recycling bin. Clean Coast have been doing wonderful work in educating people for decades about the beauty of our coasts in Ireland and how we can look after them better. 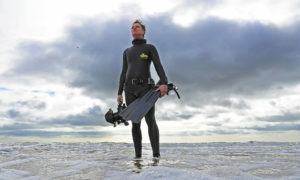 Ken O’Sullivan has been a natural history filmmaker, cameraman and ocean conservationist for thirteen years. He has produced, directed and shot natural history documentary series for RTÉ & TG4 and worked as freelance cameraman / director for BBC NHU, CBC Canada, ITV and cinematographer for TV commercials and drama projects. ‘Ireland’s DEEP ATLANTIC’ for RTÉ an ambitious natural history project exploring Ireland’s deep Atlantic waters for the first time in any TV production. Ken also produced IFTA nominated, The Silver Branch, a creative, feature-length documentary for Irish Film Board on changing nature of our connection with landscape in Ireland, intended for a theatrical release. Ken is a passionate marine conservationist and heavily involved in conservation projects on sharks, skates and rays, as well as cetacean research in the North Atlantic, working closely with academic institutions, the Marine Institute and various conservation organisations.